Cradles To Crayons is an amazing organization that provides children from birth to age 12 who live in low income and homeless situations with essential items that they need to thrive. The group relies on the generosity of the community for gently used items for children, donations to sustain their operation, and volunteers at their facilities to ensure that children in need receive all of the clothing, toys, books, diapers, and other essentials that have been collected. One Boston Day is honored every April 15 and is dedicated to the memory of the resiliency, compassion, and togetherness that the community of Boston showed in the wake of the Boston marathon tragedy in 2013. Everyone honors One Boston Day in their own way – a simple hello to a stranger, a random act of kindness, etc. 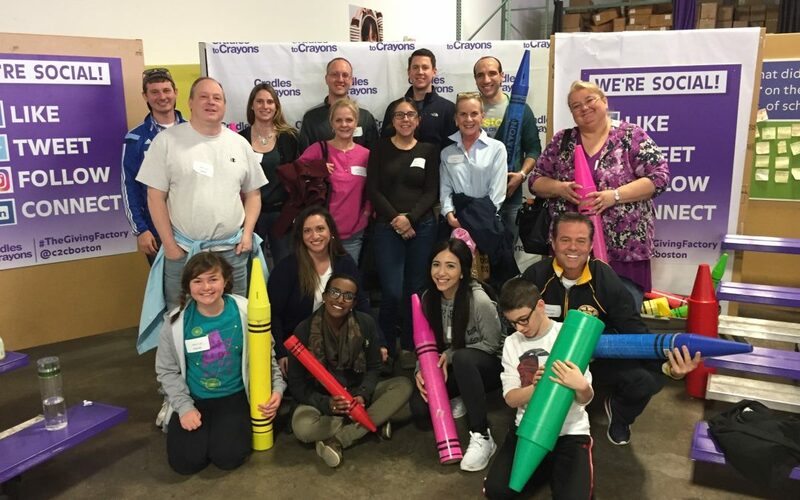 This year, CMBG3 was proud to take the afternoon of April 14, 2017 to volunteer as a team at Cradles To Crayons in Brighton, Massachusetts in honor of One Boston Day. Our team values the community in which we all live and strive to give back to the same community that means so much to all of us. We all enjoyed a day of organizing gift bags for children in need, with each child’s “wish list” for a jacket, pair of shoes, a toy, etc. being fulfilled with the donated goods available at Cradles To Crayons and prepared by CMBG3 team members for delivery to the children. If you would like to learn more about Cradles To Crayons and the ways that you can support this wonderful cause, please visit the group’s website. CMBG3 Law looks forward to continuing to support Cradles To Crayons and many other charitable and community organizations. If you would like to discuss our involvement with the community or ways that you can help Cradles To Crayons, please do not hesitate to contact John Gardella (email him or 617-936-4353, ext. 204).